I am not sure what to think about this, but it’s all true. The Pentagon has drawn up plans to protect truth, justice and the American way during a zombie apocalypse. It was created for a training mission but it is not a joke. And the plan was created by the top military strategists. Farrow: Welcome back. Shambling, mindless, flesh-eating monsters threatening to devour each other alive. But enough about Congress. No I’m talking about the pentagon’s newly revealed plan for the zombie apocalypse. I repeat, the pentagon has a zombie plan. They get that it’s silly, but they leave open the disclaimer saying while it’s not a joke, it was for training purposes. But still, zombie plan. 31 pages of it to be exact. Written in military speak. Listing eight different types of zombies to combat, from pathogenic zombies, to evil magic zombies, I don’t know what those are, to space zombies and even vegetarian zombies, you know eat plants instead of zombies. Still, the pentagon has a zombie plan. 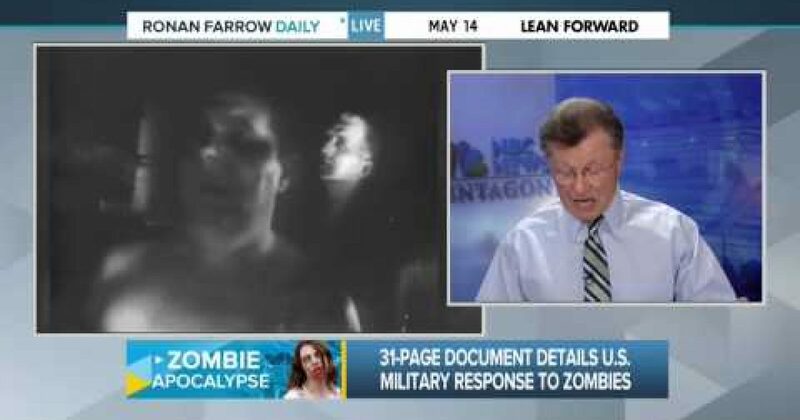 NBC’s Jim Miklaszewski joins us from the pentagon, which looks not under attack by zombies. Jim, is everything all right over there? Farrow: Jim, keep your brain safe. Miklaszewski: Yeah. An actual training plan, and they use the zombie scenario to spice it up a little bit. Miklaszewski: And make it so ridiculous that nobody could believe it’s real. But if you read through it step by step by step, it is an actual training plan in how to respond to various threats, and scenarios, that could pose a threat to the United States. Ronan. Farrow: Jim, this document was drawn up under Bob Gates’ leadership. Is Secretary Hagel doing enough on zombie preparedness? Miklaszewski: Well, we haven’t heard of him speak of it yet, but I can guarantee the next time he appears at the podium, we’ll ask him. But there is one thing that makes it clear this is not real. Because this plan doesn’t in any way consider the strategic and tactical implications regarding the differences between American and British zombies. Farrow: Very important distinction. We hope to see more progress on that. Miklaszewski: What is that difference? British zombies can run. For those of you who want your own copy of the pentagon’s zombie apocalypse plan…you know just in case…you can find it embedded below, right under the video.